SEVERAL Gulf glass products companies are set to take part in one of the leading industry events in the world – glasstec – which takes place in Düsseldorf, Germany, from October 21 to 24. UAE companies who have confirmed they will be exhibitors at the event include Glass LLC, Emirates Float Glass and Emirates Insolaire. Saudi glass firms will be represented by Saudi American Glass Company, Riyadh, and Arabian United Float Glass Company, Yanbu Industrial City. glasstec’s special show “Glass Technology Live“ held with an international trade symposium is a top attraction for visitors. “From a technical or an aesthetic point of view, this is where products and visions from research and practice are presented. The special interest themes in 2012 were: new material requirements and applications, façades and construction, solar and integral photovoltaics, innovative glass products such as curved glass, interiors and interior construction, design and aesthetics,” the show’s organisers stated. Among technologies to be presented at glasstec will be ones from German glass melting plant and machinery manufacturer JSJ Jodeit. The company will be showcasing innovations including all-electric melting furnaces for the production of alkali-free special glass with daily pull rates over 10 tonnes. Other technologies it will be presenting are a continuous process for chemical strengthening of glass and an IR-based advanced tempering technology. Chemical strengthening of glass is still done in an intermittent process. The material is dipped into an electrically heated tank filled with molten salt in order to obtain the ion-exchange required for strengthening of the glass articles. Depending on the results to be achieved, it stays there for more or less hours. Then it is removed, washed and dried and the whole process can start all over again. The output of the plant decisively depends on the number and size of salt tanks. The more glass fits in the tanks, the higher the throughput. Capacity is therefore quite limited. This drawback could be remedied by a process that is not intermittent but continuous. This is precisely what the engineers and technicians of JSJ Jodeit have put into practice. The operation is a fundamentally simple process. The pre-heated glass is not dipped into a salt tank but runs through a tunnel where it is sprayed with a special salt mixture. Then it is passed through a heating tunnel where it is heated even further and the ion exchange required for increasing strength takes place. The glass finally leaves the line cooled off and chemically strengthened. 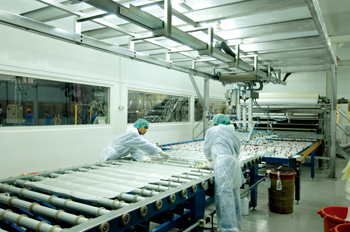 Since the line can be fed constantly, there are no interruptions in the production process unlike with the conventional method. The process is therefore continuous and this brings substantial technical and economic benefits. As Dr Harald Jodeit, managing partner at JSJ Jodeit GmbH, says, this not only helps to increase throughput many times over; even large-format glass sheets, for which specially dimensioned, expensive salt tanks have to be custom-built, could be strengthened for less with this new process. The technology is primarily suited for all glass types containing sodium and, hence, not just for standard float and thin glass but also for hollow and special glass. At present, the project is still in the trial phase. A pilot plant is being built in close cooperation with a customer, says Jodeit. A rough outline of the new process was presented for the first time at the most recent meeting of the Industry Working Party Research and Technology organised by the German Engineering Federation (VDMA) in Frankfurt. However, JSJ Jodeit has even more in store than complete production lines for continuous glass strengthening. For over a year now, JSJ employees have already been busy developing an IR-based advanced thermal glass tempering technology. Unlike with the conventional gas or electric-fired systems, the IR technology selectively heats the glass rather than the whole room. And this saves “quite a bit of energy,” says Jodeit. Furthermore, the cycle time is shorter and capital expenditure lower. Another benefit according to the managing partner is the smaller footprint. Jodeit expects the first processing lines to be available next year. glasstec will see the premiere of this technology. 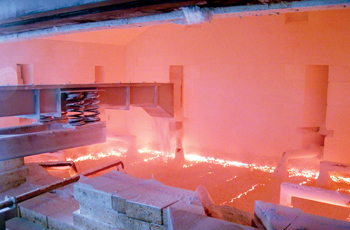 Intense research is also underway in glass melting technology. Some eight years ago the company successfully offered the world’s first all-electric melting units for alkali-free special glass to the world market. Their daily output was and still is below 10 tonnes today. Now engineers are working on increasing capacity. Jodeit says: “We expect to be able to offer daily outputs of up to 20 tonnes by next year if not sooner.” But this is not the end of it – solutions to also cover the range between 20 and 50 tonnes are already being worked on. So far only fuel-fired furnaces are used here, probably with electric boosting.